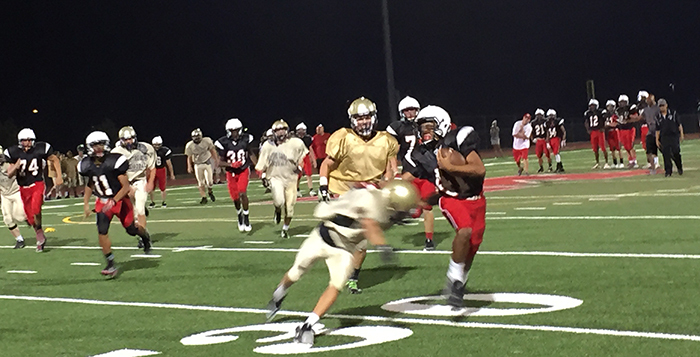 The Maricopa High School Rams football team showcased their arsenal of talent against the Notre Dame Prep Saints in a scrimmage at Rams Field Thursday night. Maricopa’s first string offense didn’t seem to have much issue moving the ball down the field. The Rams offense didn’t play a flawless game. Running backs were able to attack the holes, and quarterbacks had plenty of time to find their receivers. Receivers struggled a bit with dropped balls and poor blocking, but when Maricopa entered the red zone, their talent shined through. Junior receiver David Owens and utility player Isaiah Pedro both made spectacular plays at the wide receiver position to score touchdowns. Aaron Owens utilized his speed and arm strength at quarterback to constantly push the team forward as well. The experienced front line showed their power and how important they will be to the offensive success this season. Rarely were the quarterbacks under pressure, and the running backs gained yards nearly every time they touched the football. On the defensive side of the ball, the first string unit played very well. The linebackers and defensive backs were swarming to the ball and hitting hard. If the Rams showed any weaknesses, though, they revealed their depth on the defensive side of the ball is lacking and will need to be coached up throughout the season. The first string defense kept an explosive Notre Dame Preparatory offense in check for the most part. When the second string players entered the game, the Saints were able to spread the field and create opportunities for big plays a bit more. Overall, the Rams defense still looked vastly improved from last year. If the defense can bring that level of intensity into each game, Maricopa will likely compete well with any team they face this season. McDonald was quick to address the need to master the basics though. Despite a potent offense, the Rams lost three games last season by one score. “Losing pretty” will not be acceptable for this year’s team. As a whole, the Rams looked balanced on both sides of the ball. They still have some issues to work on, but the talent is in place to make a run at the playoffs. The team’s first real test will come on Friday when they host Agua Fria High School to kick off the regular season. The game will begin at 7 p.m. at Rams Field.